Megalith of the World II -  An epic journey of new discovery so fantastic that our natural instinct would be to block it out. The most amazing gigantic site! this site badly needs to be studied! 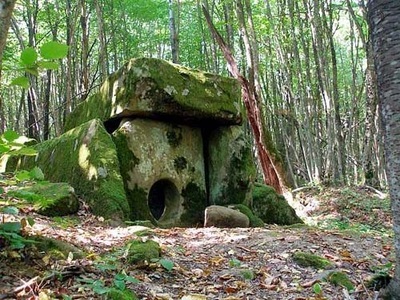 25,000 Year Old Buildings Found In Russia? In Russia, in the Caucasus mountains, not far from the cities Tzelentzchik, Touapse, Novorossiysk and Sochi, there are hundreds of megalithic monuments. 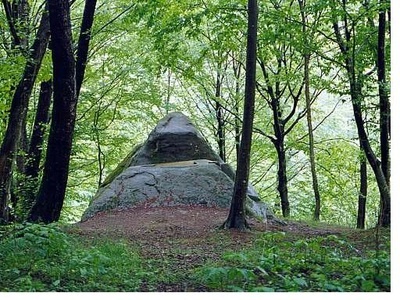 The Russians call them dolmens. 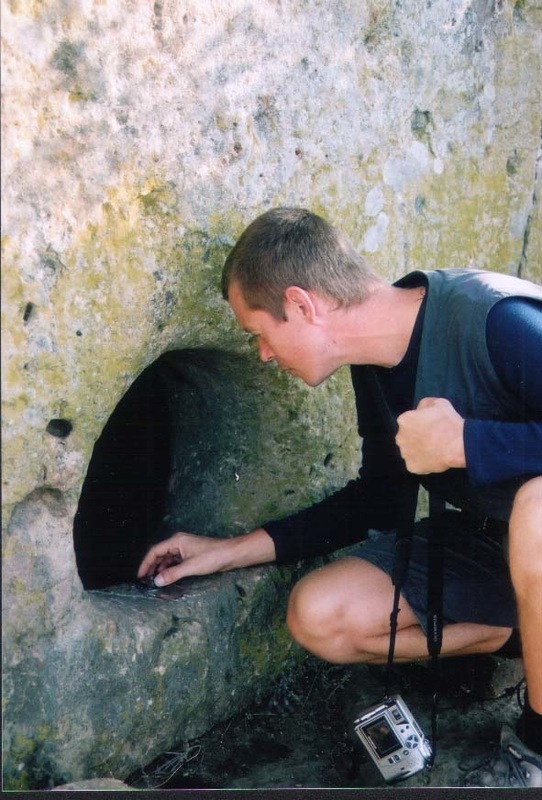 Russian and foreign archaeologists have not yet discovered their use. 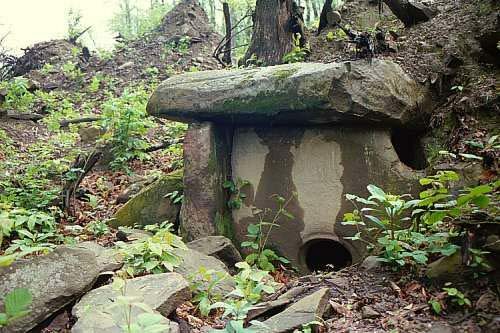 All these megalithic dolmens you see below in the pictures are dated from 10,000 years to 25,000 years ago, according to the website Other archaeologists put the age of these megalithic structures at 4000 to 6,000 years old. 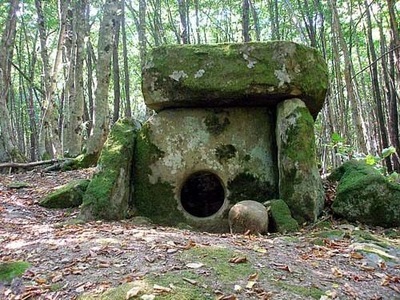 Thousands of prehistoric megalithic monuments are known throughout the world. 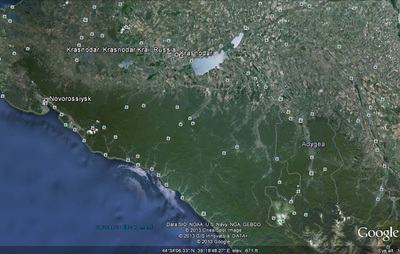 Some of the least known outside the former Soviet Union, however, are those in the Caucasus. 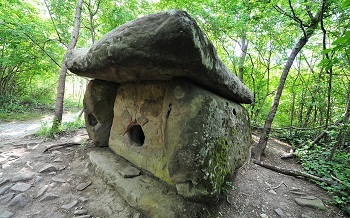 These dolmens cover the Western Caucasus on both sides of the mountain ridge, in an area of approximately 12.000 square kilometers of Russia and Abkhazia. 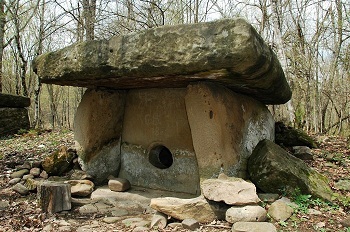 The Caucasian dolmens represent a unique type of prehistoric architecture, built with precisely dressed cyclopic stone blocks. 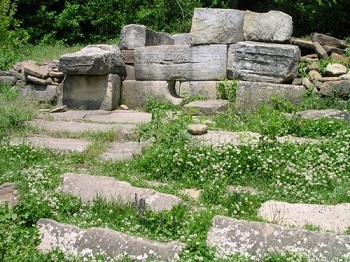 The stones were, for example, shaped into 90-degree angles, to be used as corners or were curved to make a perfect circle. 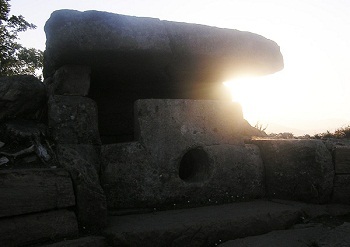 The monuments date between the end of the 4th millennium and the beginning of the 2nd millennium B.C. In spite of the variety of Caucasian monuments, they show strong similarities with megaliths from different parts of Europe and Asia, like the Iberian Peninsula, France, Great Britain, Ireland, Netherlands, Germany, Denmark, Sweden, Israel and India. 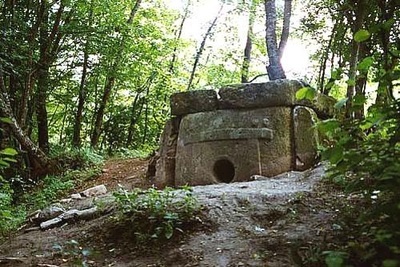 A range of hypotheses has been put forward to explain these similarities and the building of megaliths on the whole, but still it remains unclear. 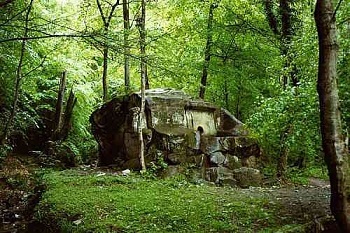 Concentrations of megaliths, dolmens and stone labyrinths have been found (but little studied) throughout the Caucasus Mountains, including the Abkhazia. 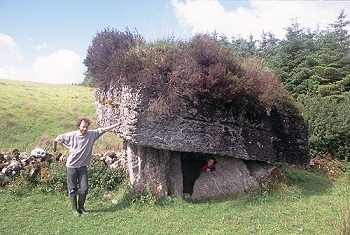 Most of them are represented by rectangular structures made of stone slabs or cut in rocks with holes in their facade. 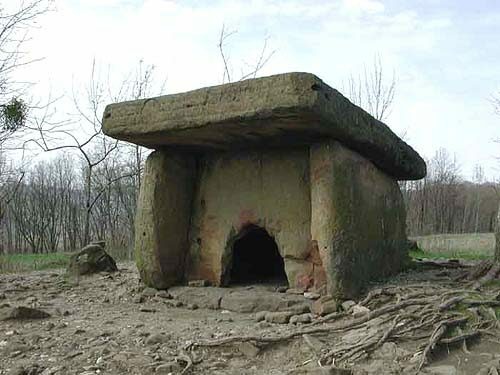 These dolmens cover the Western Caucasus on both sides of the mountain ridge, in an area of approximately 12.000 square kilometres of Russia and Abkhazia. The dolmens have a limited variety in their architecture. The floor plans are square, trapezoidal, rectangular and round. 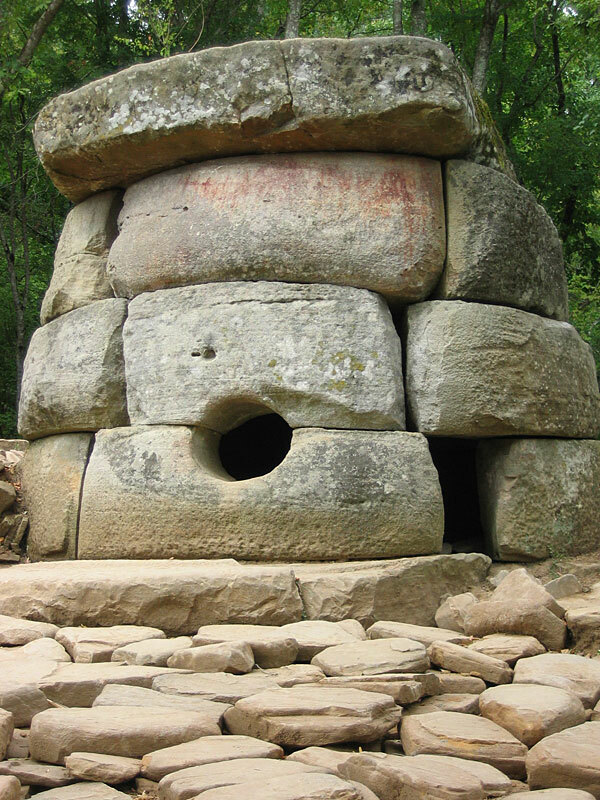 All of the dolmens are punctuated with a portal in the center of the facade. 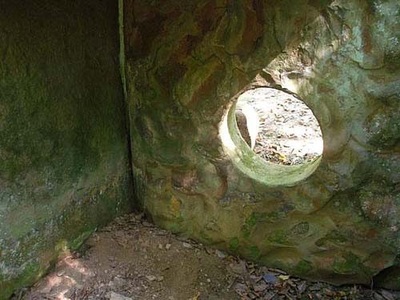 While round portholes are the most common, square ones are also found. In front of the facade is a court that usually splays out, creating an area where rituals possibly took place. The court is usually outlined by large stone walls, sometimes over a meter high, which enclose the court. 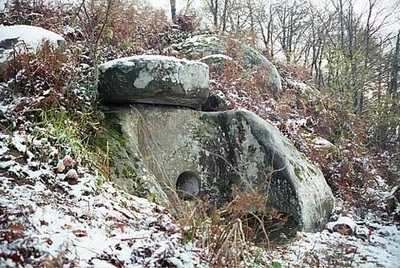 It is in this area that Bronze and Iron Age pottery has been found – which helped date these tombs -, along with human remains, bronze tools and silver, gold and semi-precious stone ornaments. The repertoire of decoration for these tombs is not great. Vertical and horizontal zigzags, hanging triangles and concentric circles are the most common motifs. One decorative motif that is quite common is found across the top of the porthole slab. 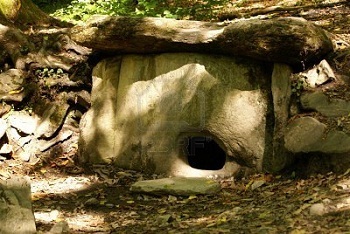 It can best be described as a lintel held up by two columns. Pairs of breasts, done in relief, have also been found on a few tombs. ​These breasts usually appear above the two columns of the porthole decoration. 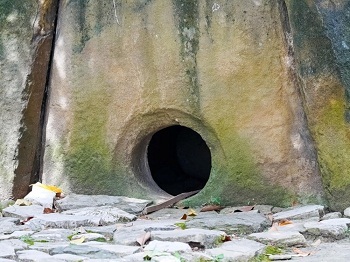 Perhaps related to these are the stone plugs, which were used to block the porthole, and are found with almost every tomb. They are sometimes phallic-shaped. 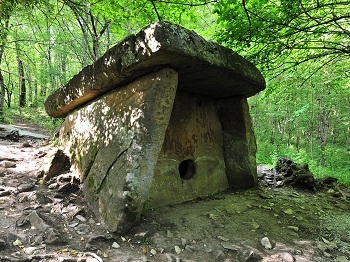 One of the most interesting megalithic complexes – group of three dolmens – stands in a row on a hill above Zhane River on the Black Sea coast in the Krasnodar area near Gelendzhik, Russia. In this area there is a great concentration of all types of megalithic sites including settlements and dolmen cemeteries. 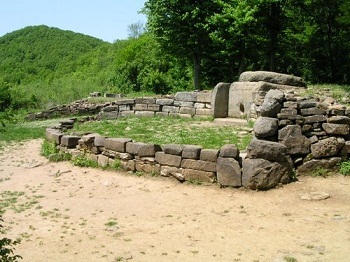 Large stone mounds surrounded the two monuments. 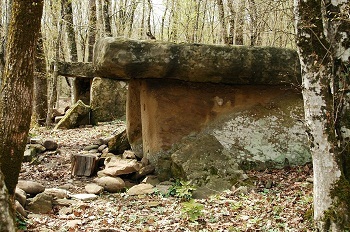 The central dolmen is rectangular in plan, 4 x 4 meters, while the two flanking dolmens are circular, 4 and 5 meters in diameter. 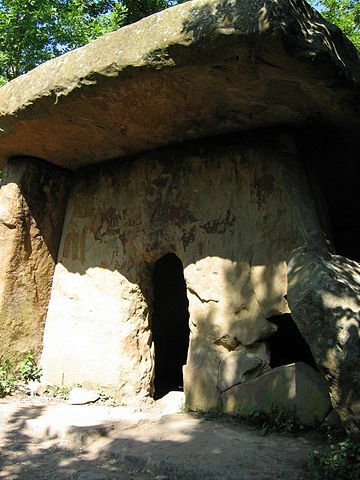 The two round dolmens had been bulldozed – probably in the 1950s – in order to harvest the surrounding trees, but the main structure of the central dolmen had not been damaged. 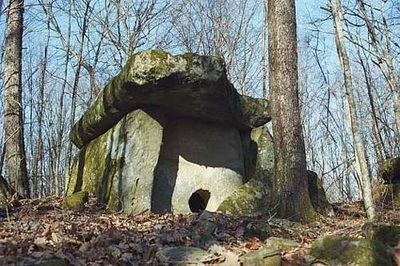 The dolmens have a limited variety in their architecture. The floor plans are square, trapezoidal, rectangular and round. All of the dolmens are punctuated with a portal in the center of the facade. While round portholes are the most common, square ones are also known. In front of the facade is a court that usually splays out, creating an area where rituals undoubtedly took place. 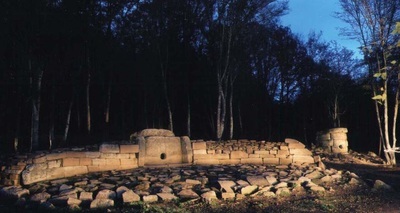 The court is usually outlined by large stone walls, sometimes over a meter high, which enclose the court. It is in this area that Bronze and Iron Age pottery has been found – which helped date these tombs -, along with human remains and bronze tools and silver, gold, and semi-precious stone ornaments. 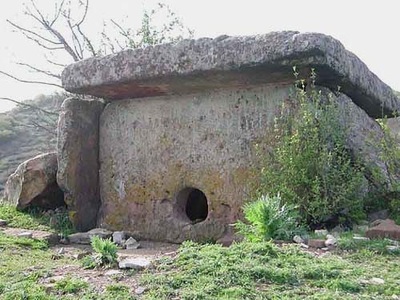 The repertoire of decoration for these tombs is not great. Vertical and horizontal zigzags, hanging triangles and concentric circles are the most common motifs. 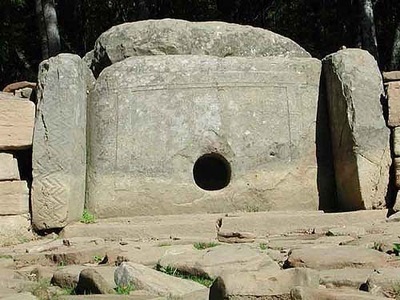 One decorative motif that is quite common is found across the top of the porthole slab. 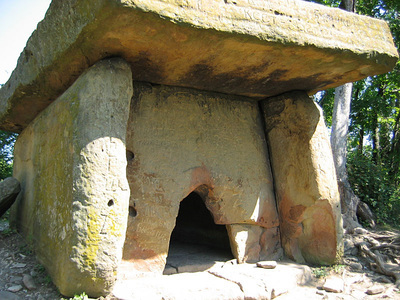 It can best be described as a lintel held up by two columns. Pairs of breasts, done in relief, have also been found on a few tombs. 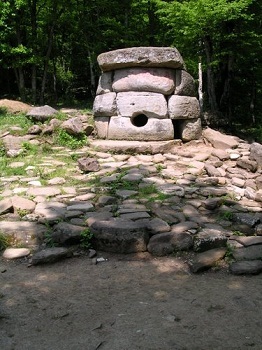 These breasts usually appear above the two columns of the porthole decoration. Perhaps related to these are the stone plugs which were used to block the porthole and are found with almost every tomb. They are sometimes phallic-shaped. Some unusual items associated with dolmens are big round stone balls, double balls and animal sculptures. Is Sport a Sub-Human Activity? I killed the flu virus in one night!